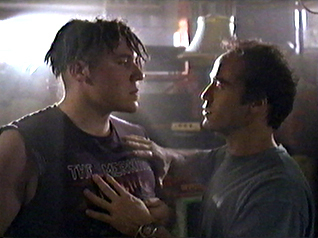 I watched PCU (1994) on 2.18.10. It was my first viewing of the film. TRAILER HERE. I was worried about this movie when it was ten minutes in, but it certainly gets better as it goes. This is a snapshot in time (I even heard a reference to No-Fear tee-shirts). It does catch a time when the politically correct movement was perceived to be squashing ‘fun’. It is interesting how this film takes what would normally look like a conservative stance, then turns around and makes its villain a blatantly anti-poor, racist, elitist. This movie doesn’t care to make too much of a statement, it is a light comedy after all. Jeremy Piven is funny as hell in this. He carries it, though he does so with the help of his grounding roommate Alex Desert. Other than those two? The acting is quite pedestrian. Jon Favreau wouldn’t be funny if it wasn’t Jon Favreau. There is a lot of stereotypical type-casting in this thing. The jokes are good but not great. I laughed out loud a few times, but not consistently. Some moments were just too out of left-field to feel truly funny. I didn’t always believe the story happened in a consistent universe. Ultimately, I liked this better than I thought I would. It took me for a fun little ride, and that’s all you can really ask from something like this. The bonus is for the music. Steve Vai does the score, which is much better than your typical comedic score, and the George Clinton stuff at the end is great fun. ~ by johnlink00 on February 18, 2010.